So you've taken a look at Director 8.5 and Shockwave 3D. The 600 page manual. The online materials. The 3D modeling software on your own shelf. You've even played around with the 3D text feature. But still you wonder exactly how you're supposed to get from one to the other. For all of its impressive heft (0.98kg), the What's New in Director Shockwave Studio manual that comes with Director 8.5 is surprisingly light on how to make a Shockwave 3D world (W3D) that you can get into Director. As Gary Rosenzweig's series of Lingo Lounge articles on Shockwave 3D showed, you can create 3D worlds using Lingo alone. This can be a time-consuming task if your models are complex, especially if you're working with material that's already been created with a 3D modeling program. Several modeling applications have been touted as useful for development of models for Shockwave 3D. Discreet 3D Studio Max and Maxon Cinema 4D have exporters shipping. Alias/Wavefront Maya and NewTek Lightwave both have exporters in public beta. Ashlar-Vellum Neon (which has some modeling capabilities) and other tools are out there to convert models from a variety of formats to the W3D format. If you've spent any time converting 3D formats, though, you may get heart palpitations when you think about relying on an external tool and hoping that everything comes through with all of the faces and textures in place. And unless you're doing a lot of 3D work already you probably haven't shelled out several thousand dollars for any of the aforementioned programs (the lowest price for any of them I saw was Cinema 4D, which had a cross-grade price of US$1,295 if you had Raydream, Strata, or other apps already). So what can you do if you just want to dabble in the world of Shockwave 3D? Here are a few baby steps. This doesn't stand for some sort of virtual gumshoe. The 3D Property Inspector is an amazing piece of software from Austrian developer Ursula Gusenbauer (that's ullala to you folks on the mailing lists). 3DPI is a Shockwave movie that runs as a Movie in a Window Xtra. With 3DPI, you can examine and even temporarily modify just about everything in a Shockwave 3D cast member. As an aid to learning about the new Lingo it's indispensable. As an example of Director programming, with its 13 tabs, dynamic window elements, scores of sliders and popup menus, and access to just about everything inside a Shockwave 3D world, it's simply amazing. To use 3DPI, you just open a Director movie that has a 3D cast member (even an empty one), open 3DPI from the Xtras menu, and select a 3D world. With the 3DPI, you can add and modify textures, shaders, model resources, models, lights cameras and even Havok physics properties. You can watch the innards of your 3D world even as it's running in Director. I haven't tried this, but I suspect that you could probably even use 3DPI as a debugging tool in a projector by adding a call to open the DCR as a Movie in a Window. With the 3DPI window open and a Shockwave 3D sprite on the Stage (or with the Shockwave 3D window open), you can view the results of your changes in real time. 3DPI can output a variety of transform and other property values into the Message window. It can really speed up the process of learning about the structure of the 3D world, and save you countless hours of fruitless Lingo poking. The only downside 3DPI has isn't its fault. It can't save the changes you make with it. A Shockwave 3D world is set in stone at the time it's exported, and while you can affect its cast member properties and save them along with the movie, the internal structure of the cast member can't be updated. By keeping track of the values you see in 3DPI, though, you can recreate what you've done with a series of Lingo statements. That's what 3DPI's all about. 3DPI is shareware, if you register, it will stop alerting you to that fact and closing itself at intervals. The latest version (3.6 as of 3 August, 2001) is available for US$50 from http://www.ullala.at/3dpi/. Because it's a Shockwave movie itself, it works cross-platform. What if you actually want to make something a bit more complex? If your budget is lean and your needs are simple, take a look at ShapeShifter3D, from longtime Brazilian Xtra developers Tabuleiro. Like 3DPI, ShapeShifter3D (SS3D), is implemented as an Xtra. ShapeShifter3D is a file converter that can import 3D Studio ASC geometry data as well as Alias/Wavefront OBJ files (which can be linked to texture and mapping information). Like other converters, it has to deal with the fact that not every program exports foreign file formats perfectly. Where SS3D really beats expectations for an Xtra is the fact that in addition to converting files to W3D, it lets you edit the imported files, right down to the vertices. In fact, you don't even need to import anything, because Tabuleiro has licensed the code for the 3D modeling tool MilkShape3D and incorporated it as the basis for SS3D. In the composition above (my tribute to Joe Sparks's Devil Doll, Stayin' Alive in Hell), you can see the basic interface of SS3D. The viewports in the main portion of the window can be set up in a variety of configurations. Each viewport has independent zooming and panning capabilities, and they can be set to different views. You can see the model in Shockwave 3D (discover for yourself that DD has a face on both sides! ), or download the Director 8.5 and ShapeShifter 3D files for Mac or Windows. At the left are two palettes. The Tools palette contains selection and transformation tools. The Create palette makes points, shapes, and even joints. One of the create tools can join three arbitrary points into a polygon face. The selection tools are surprisingly responsive. The Ignore Backfaces option lets you toggle on and off the ability to select through a face to the unseen side, even when you're dragging the selection tool. It's a cinch to import a bitmap and assign it to an object in SS3D. Each group can have its own texture, and the Texture Coordinate Editor in this little application beats some I've seen in programs that cost many time more for its ease of use. Tabs on the right of the viewports let you edit vertices, faces, joints, materials and groups. Faces can be selectively subdivided into 3 or 4 faces. Vertices can be flipped. Groups can be grouped together. SS3D saves files into its own format so they can be edited later. It can also export W3D files, and even gives you to option to add (or replace) a Shockwave 3D cast member in the currently open Director movie. There are a few limitations to SS3D. It can't do animations as of yet, and it can't export the bones it creates (according to Tabuleiro, this is slated for a future release). Some of the numeric transformation fields were unresponsive (i.e. I couldn't select them at times), you can't tab through them, and there aren't any keyboard shortcuts. The window's not resizable, which at 794x530 pixels made it seem awfully small on my 22" monitor. The current version of SS3D only creates a single model resource within the W3D file, so you can't get Lingo access to individual models within the world, although you can use Lingo to import and combine multiple W3D cast members. But what do you want from an Xtra? The introductory price is US$99 from http://www.shapeshifter3d.com (don't leave off the 3d or you get one of those sites that jiggles your browser window around). Be sure to get the three digital video movies from the Download page, they're extremely helpful when you're in the process of learning ShapeShifter3D, the manual is a bit spare. Caligari trueSpace has been around as an economy 3D package for a number of years, and it has evolved into a sophisticated modeling and rendering program that now includes features like NURBS curves, subdivision surface modeling, muscles, 3D painting, and even physics simulation. The recently-released version 5.1 added some new modeling features, but the updated Conversion Pack add-on gives trueSpace the ability to export Shockwave 3D files. trueSpace is a full-featured 3D modeler, and as such it has a fairly steep learning curve. Its dozens of commands and tools are represented by icons, often buried one or two levels deep on palettes arrayed around the screen. There don't appear to be any keyboard shortcuts, so you really must become familiar with the full range of icons, because the currently selected tool from a particular menu becomes the visible icon when it's been selected. I found myself reading the status area cues a lot while I was learning this program. That said, exporting files from trueSpace to Shockwave 3D is almost too easy. You just do a Save As, pick Shockwave 3D from the format list, and you're done. There's a preview option in the Export dialog that lets you view and rotate the W3D model, but since it takes as long to create the preview as it does to export the model (which is only a long time if the model is complex), if you've got Director installed on the same machine, you might as well skip this step and just import the file. trueSpace can export keyframe animations but not animations that use bones. In fact, if the model has bones in it at all, it can prevent the keyframe animations from being exported. One intriguing feature of trueSpace is its physics simulator, which can create a keyframe animation based on collisions of models in the world. This isn't the type of interactive, real-time physics simulation that the Havok engine provides, it's a static animation that is set once the world is exported. The model in this Shockwave 3D example is one of the tutorials on physics simulation a rubber ball bouncing down several stairs. 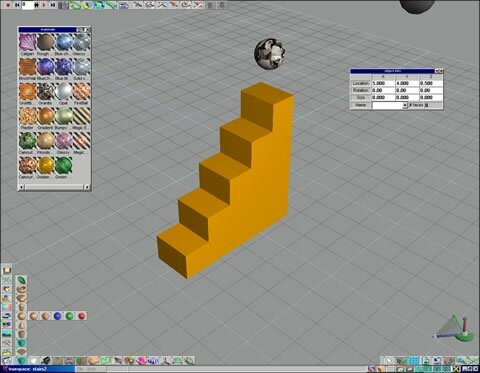 The 3D model consists of a sphere and several boxes for stairs. Using trueSpace's physics tools, you can assign the sphere a rubber property to make it bounce (restitution to the physics-initiated) and initial motion vectors for spin and directional motion. trueSpace creates the motion path. The original file has just a single keyframe. You can download the Director 8.5 and trueSpace 5.1 files for Mac or Windows. The variety of modeling options in trueSpace make it the most full-featured of the Shockwave 3D creation tools I've seen so far. It takes some getting used to before you can easily work in it, but that's true of any complex program. Polyhedron, metaball, and NURBS models are converted to polygons at export. trueSpace's subdivision surface (SDS) objects are compatible with the SDS capabilities of Shockwave 3D. Individual models and model names are maintained, as are multiple cameras, fog, and lights. I only ran into a few problems with trueSpace. Try as I might, I couldn't get it to work correctly with my Wacom tablet on a USB-compatible Windows machine. Using a mouse presented no problems. trueSpace is a Windows-only application. Attempting to run it within VirtualPC was not only slow (something you ought to expect from a program that requires as much CPU horsepower as a 3D program does), but made it impossible to control on my G4. Something about the way mouse and tablet movement gets translated through the VirtualPC interface doesn't seem to work well with trueSpace. If you're a Mac user looking for a low-price tool to create Shockwave 3D animations without Lingo, you're still out of luck. trueSpace 5.1 is available from Caligari (http://www.caligari.com) as well as many mail order and retail sources for US$299. The Conversion Pack, which contains the Shockwave 3D exporter is an additional US$99. Check the Caligari Web site for updaters to the latest version and upgrade pricing, or to get a 14-day trial. Caligari trueSpace is in the price range of 3D tools that Macromedia should have focused on if they wanted Shockwave 3D to get off the ground running. Others in the same range would be programs like Curious Labs' Poser (a third-party exporter is reportedly in development), Hash Animation: Master, Corel Bryce, and Strata 3Dpro. No, they're not as "professional" as Max, Maya, or Lightwave, but they are more than adequate for creating the bulk of the types of models that are likely to be used in Shockwave 3D. An awful lot of people have them already, and the more options developers have for creating 3D content, the more is going to be done. These three tools are not mutually exclusive. They're all useful in their own way, and even if you bought all of them, you'd still be way ahead of a purchase of any of the other programs with Shockwave 3D export. Heck, if you're a Mac user without a Windows computer, you could buy all of these and a fairly fast Celeron processor and still come out ahead. If you've been wanting to create your own Shockwave 3D content without busting the bank, take a good look at ShapeShifter3D. It will definitely get you off the ground, it's fairly easy to learn, and it's surprisingly fast at creating complex shapes and applying textures.. If you need to create more complex models or animations, try out trueSpace 5.1 and the Conversion Pack. Get it well before you're going to need to do anything so that you've got some time to learn it. And whatever you do, if you're working in Shockwave 3D at all, get 3DPI for the insight and control it provides.